Calling all cat owners around Malaysia! 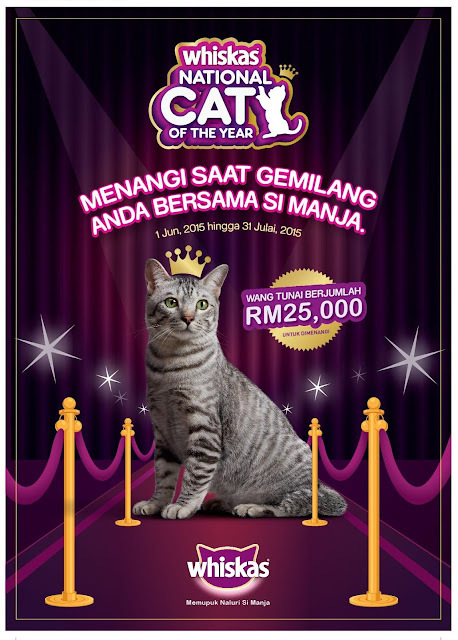 The Whiskas National Cat of the Year 2015 contest by Mars Foods Malaysia Sdn Bhd (Mars) is running in full swing and there’s still time for you to submit your feline furkid as an entrant! The contest which kicked off on 1 June is running until 31 July. There are three categories - Bright Eyes, Shiny Fur Coat and Lively and Energetic. “Cat lovers always ensure that their cats are given the best nutrients to bring out the best in them, thus offering their beloved pets the best quality of life. We love our cats for their independent spirit and personality, but we also understand that they rely on us to provide complete and balanced nutrition for ideal health. 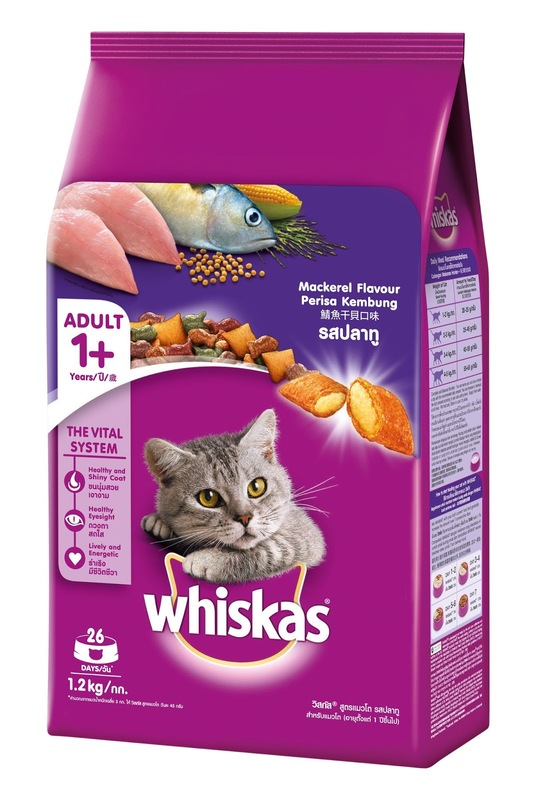 At Mars, our Whiskas products - which now come in new packaging, contain our proprietary Vital System benefits to enhance the three key signs of a healthy cat - healthy eyesight, a healthy and shiny coat and as well as a lively and energetic demeanour. Recognising these signs is something every cat owner should know in order for them to provide the best care and attention,” said Helen Hidvegi, Marketing Director of MARS India, South East Asia & Thailand. “In line with highlighting these key signs, we are excited to encourage all cat owners to participate in the Whiskas National Cat of the Year 2015 contest. With just a close up of their cat’s bright, clear eyes in the Bright Eyes category, a photo showing off their cat’s healthy fur coat in the Shiny Fur Coat category or an action shot of their cat being active and energetic in the Lively and Energetic category, cat owners can stand to win the grand prize of RM10,000 cash and a year’s supply of Whiskas products,” Helen Hidvegi added. To participate in the Whiskas National Cat of the Year 2015 contest, all you need to do is to send in a picture of your cat for any of the three categories – Bright Eyes, Shiny Fur Coat or Lively and Energetic via the Whiskas Malaysia Facebook page or normal post via Pos Malaysia using the contest form available at outlet selling Whiskas products near you. Each entry must be accompanied by proof of purchase of any Whiskas products purchased between 1 June and 31 July 2015. Each participant may submit multiple entries in all categories, of the same or different cats, but each submission must be accompanied by a different proof of purchase, and each person is only eligible for one prize. To participate or to find out more about the Whiskas National Cat of the Year 2015 contest, log on to the Whiskas Malaysia Facebook page. Mars brands include: Petcare – PEDIGREE®, ROYAL CANIN®, WHISKAS®, BANFIELD® Pet Hospital, CESAR®, SHEBA®, DREAMIES® and NUTRO®; Chocolate – M&M’S®, SNICKERS®, DOVE®, GALAXY®, MARS®, MILKY WAY® and TWIX®; Wrigley – DOUBLEMINT®, EXTRA®, ORBIT® and 5™ chewing gums, SKITTLES® and STARBURST® candies, and ALTOIDS® and LIFESAVERS® mints; Food – UNCLE BEN’S®, DOLMIO®, EBLY®, MASTERFOODS®, SEEDS OF CHANGE® and ROYCO®; Drinks – ALTERRA COFFEE ROASTERS™, THE BRIGHT TEA COMPANY™, KLIX® and FLAVIA®; Symbioscience – COCOAVIA® and WISDOM PANEL®.